Boiling the kettle for a cup of tea, putting a second load of washing on and relaxing in a lovely warm bath; all things that we do every day, but don’t think twice about. While there’s nothing wrong with these daily occurrences, it’s easy to forget just how much water they require and the effect this can ultimately have on our water bills. It’s easy to forget how much these day-to-day acts all add up until our water provider presents us with the dreaded bill. Only then does it become apparent that water can, in fact, cost quite a bit of money! It’s common for water to be used carelessly, with it being quite literally on tap, but it’s vitally important to consider your usage in order to save money on water bills and keep your monthly costs down. While some of these easy ways to reduce your water usage may seem trivial; when applied to everyday life, it’s incredible just how much of a difference they can make. Before you put some of these tips into action, it’s worthwhile looking at the way you pay your water bill. 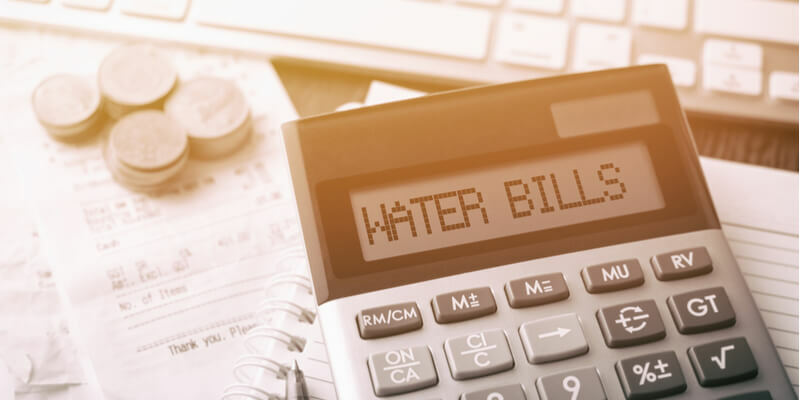 Depending on where you live, it could be beneficial to be on a water meter as opposed to being charged a rateable value per month. As detailed in this article from uSwitch, domestic water rates can fluctuate depending on water availability in your region. This means that being on a water meter may sometimes prove to be a cheaper alternative. Why not use the water usage calculator tool on United Utilities and see if making the switch would be worthwhile? They also offer advice on how to go about getting a water meter installed if you do decide to go down this route. Whichever option you decide is best for you, the following steps will definitely help you save money in the long run. By reducing your water bills, you’ll have spare cash for holidays, cars or even a new house – as every little amount saved will help towards other expenses. Take a look through our article and try to implement them wherever you can in your day-to-day life. It may not seem like a big deal, but leaky taps can actually waste a great amount of money if left. To give you an insight into just how much wastage we are talking; if your tap leaked a droplet of water every second of every day, one gallon of water would be wasted every four and a half hours. This means that every day, 5 gallons of water would be wasted, amounting to 2.082 gallons per year! Apart from the crazy amount of water they waste and being really annoying to listen to, a leaky tap generally indicates that a part needs to be replaced. While this is often just a small fix, such as a new washer, if nothing seems to work, it may be worth calling in an emergency plumber to sort the problem out right away. Having offered emergency plumbing in Milton Keynes for many years now, we have fixed many leaky taps in our time and can testify as to how much water they can waste if unresolved. While a leaky tap may seem like a simple problem to sort out yourself, we would always recommend calling in a professional to identify the underlying cause and sort it out efficiently. While having a nice bubble bath every so often is a nice treat, you should try and avoid doing this regularly as the water use is huge compared to a shower. To fill a bath, around 70 gallons of water is required, whereas a five-minute shower uses around 10-25. Seeing this statistic alone is enough to prove how much water you could save by switching your bath for a shower. To go one step further and save even more money, why not consider installing a low flow shower head? By buying a shower head with a flow of less than 2.5 gpm, your shower will work very efficiently, and you’ll undoubtedly save water. Ecocamel have a great selection of low flow shower heads for you to choose from. Our plumbers in Milton keynes and surrounding areas regularly install special fittings if this is something you’d be interested in trying out. When brushing your teeth twice a day, you’ll probably leave the water running while the toothbrush is in your mouth – like many of us do! This, however, will waste a large amount of water, particularly if your household comprises of many family members. Turning your tap off while cleaning your teeth is something that you can start doing immediately, which will help to save money off your next bill. While it isn’t for everyone, why not consider buying a toothbrush holder for your shower? This way, you can kill two birds with one stone and clean your teeth while showering. Many places, such as UK Bathroom Store, have wall mounted and suction toothbrush cups for people who like to combine their showering and teeth cleaning! Leaks can come from numerous places and are sometimes hard to spot, which can be a nightmare when it comes to water waste. A burst pipe, for instance, can occur within a wall, causing water to leak profusely. Not only will this create a lot of costly damage but the water waste will make your bill spike. Leaks can also come from appliances or radiators and are only noticeable once a puddle or flooding has occurred. Some broken appliances are more serious than others, one of which includes boilers; becoming quite dangerous when leaking. Water and electrical components are never a good combination, so it’s essential to have your appliances tested on a regular basis. This way, you’re more likely to stop a leak before it has the chance to happen, as your fixtures will always be in a good working order. We carry out boiler servicing in Milton Keynes regularly to ensure that leaks never occur. It may be tempting to wash a top on its own if you desperately need it for a night out, for example, but by doing this, you’ll waste a huge amount of water. It’s definitely worth waiting until you have large loads of washing, so you’re using your washing machine as efficiently as possible. If your current machine is on its last legs, you may want to consider buying an energy-efficient washing machine, to use as little water as possible. The Spruce have a handy article, listing the differences between high efficiency and traditional washing machines and things to consider. Although this may sound completely the wrong way round, using a dishwasher saves much more water than continually hand washing your dishes. Similar to keeping your tap running while cleaning your teeth, you’re likely to do this while washing dishes in the sink. The amount of water use by doing this will be huge and will add up to much more than a full dishwasher would need to do its job effectively. This is particularly so if you wash dishes in the sink more than once throughout the day, as your tap will be running needlessly on one more than one occasion. Instead of doing this, fill up your dishwasher during the day and pop it on when you go to sleep; this way, you’ll only be using water that is absolutely necessary. Similarly to the washing machine, you can buy energy-efficient dishwashers, to use as little water as possible. Take a look at this guide from sust-it for the best energy-efficient dishwashers on the market. If you don’t own a dishwasher, there are still ways in which you can save water. Make sure you fill up a washing bowl within your sink, so there isn’t the need to keep hot water running over your dishes as you clean each one. How often do you let the tap run a little to let is get cold before filling up a glass of water? No one likes to drink tepid water that has been sitting in the tap for a while, but unfortunately, this also adds to your water wastage. Again, while this is a little fix, it soon adds up and can save a considerable amount off your water bill if you make a conscious effort to stop. Instead, why not invest in a good water filter which can be kept in the fridge? This way, you’ll have access to lovely cold and filtered water whenever you need it. Did you know that toilet flushing accounts for a whole third of a household’s entire water usage? That’s a massive amount, so to end our list, we highly recommend taking a look at how you use your toilets. It sounds weird, but how many times have you popped a tissue, wet wipe or even hair down the toilet and used it as a bin? It’s likely that at least someone in your household does this occasionally, but it should be stopped as soon as possible, as this uses a large amount of water unnecessarily. Toilets can use up to 7 gallons of water per flush, especially if they are old, so by flushing when it isn’t needed, you will, unfortunately, be adding to your water bill. Another thing to consider when it comes to your toilets is the installation of a water displacement device. These are easily placed inside the cistern of each toilet, and retain water when the toilet is being flushed, saving around 3 litres of water each time. You could also think about replacing old toilets with new ones that have a dual flush system, which is proven to save money on your monthly water bill. For information on both of these and more water saving ideas, take a look at Save water Save money; a great site if you’re looking to save money on your water bill. There’s no doubt that by reducing your water usage, you’ll save money on your water bills. By following these pointers, the next time your bill hits the doormat, you’ll be pleasantly surprised at how much lower it is to normal. Even the smallest of actions, from turning your tap off while cleaning your teeth and reducing toilet flushing, will make a huge difference, so it’s well worth putting some into action. We hope you’ve found this helpful and have gone some way to helping you save money. Help your family and friends do the same by sharing this article on social media; they will all definitely thank you for it when their next bill arrives!